It’s been 90 years since the iconic Mickey Mouse made his first appearance! To celebrate this magical milestone, we’re giving TWO lucky winners the chance to get their hands on this set of Mickey figurines. The perfect collectable for Disney fans. To enter, simply wish Mickey your best birthday wishes and we’ll pick the winners at random. Competition closes at 9am tomorrow! Full T&Cs apply. We know that terms and conditions can be tedious but please try and read them all – we’d hate it for your entry to be invalid. 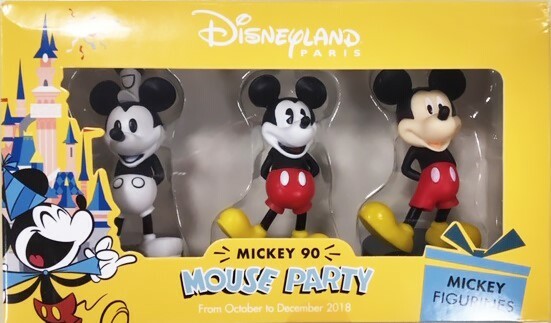 Two winners will receive one set of Mickey at 90 Mouse Party Figurines. The following conditions apply to the redemption of the prize. The prize is as described in the prize overview. Entry to the Competition is limited to one entry per person. The Prize is non-transferable, non-refundable, non-changeable and no cash alternative is available in whole or in part. Details of the prize are as described, they do not include any additional benefits. On Monday 3rd December 2018 only, Travel Republic will publish a post on the Travel Republic Facebook page with details on how to the enter the competition. To enter, fans must comment on the competition post with a response, deemed appropriate by Travel Republic to the following “Simply wish Mickey your best birthday wishes” . Only one entry per social account will be entered. Shares and likes on any of the social channels will not be counted. Valid entries are comments with a suitable answer on the competition post, as deemed by Travel Republic, posted between 13.00 on Monday 3rd December 2018 to 09.00 GMT on Tuesday 4th December 2018. Travel Republic do not accept any responsibility for entries which are not received or delays in receiving entries after this time. By entering the competition, fans agree to an employee of Travel Republic contacting them via private message on Facebook, ONLY if they win the prize draw. Should the winner not respond to Travel republic’s message, within three days of being contacted, Travel Republic will choose another winner at random and contact this winner via private message on Facebook. Entrants must be over 16 years old and be a UK resident as at Sunday 2nd December 2018. This competition is not open to Travel Republic or Disney employees. All valid comments will be entered into a free prize draw and one winner will be chosen at random. Once announced across Travel Republic social channels, the winners chosen at random are final and no correspondence will be entered into concerning it. Travel Republic reserves the right to terminate, amend or extend this Competition in the event of exceptional circumstances outside its control which affect its ability to operate the Competition. The Walt Disney Company Limited has no responsibility whatsoever with the running of this prize draw, and shall not be liable for any losses, damages or costs should a reader make any claim against the Promoter as a result of the running of this Prize draw.